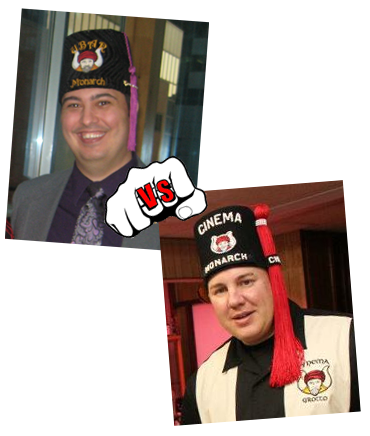 Ubar Grotto is proud to announce that they are the winners of 2012 East Vs. West Grotto Membership Challenge. Back in December of 2011 our Monarch, Pro. Seth Anthony, challenged the Monarch of Cinema Grotto, Pro. Chris Plucinski to a contest to see who could get more new members in from January 1 to March 31, 2012. The terms of the contest started simply – the winning Monarch would buy the losing Monarch an Enchanted Lantern as well as a case of libations for the winner’s members. Cinema then upped the ante to include a physical visit by the losing Monarch to the winning Monarch’s Grotto. Our Monarch accepted these terms and then began rallying the membership. His confidence proved well founded, as the members of Ubar came through in stunning fashion. In total, Ubar took in fourteen members in three months, with nine in February alone! Plus, Ubar still has three petitions from candidates who couldn’t make any of the Ceremonials. It was a great showing by Ubar, for sure! While the Grotto is happy to bask in the warm glow of a victory, the real winners are the new members who have joined the Realm. The two Grottoes produced twenty new members in three months, which is a huge boost for any Masonic organization. Congratulations to all who participated and all of the new members of both Grottoes – this is what the fraternity is all about!